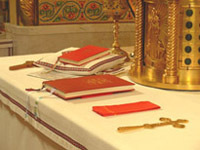 Altar – A large table in the sanctuary of a church that is used by the priest during services. 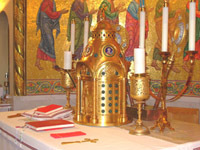 The tabernacle is kept on the altar. 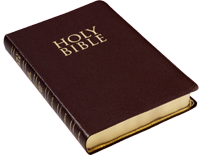 Bible - The sacred scriptures of Christians. The bible is composed of the Old Testament; covering the time before Christ was born; and the New Testament, which covers the time after Christ was born. Capital (in architecture) - The top part of a pillar, often beautifully designed. 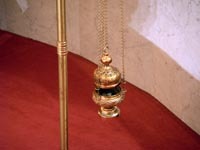 Censer or kadilo - A covered incense burner hung on chains. 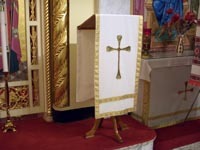 It is swung by the priest or deacon at specified times during a liturgical service. 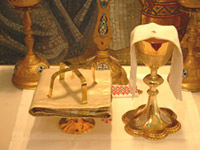 Chalice – (pictured on the right) A tall cup, usually of gold or silver, used to hold the wine during Divine Liturgy. 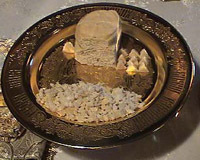 On the left is the diskos (see Paten below) with the four legged asterisk on top of the cloth. 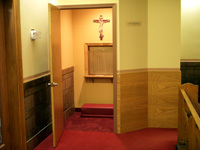 Confessional - A small, private room for the sacrament of reconciliation where a priest hears confessions. Crucifix - A representation of Christ on the cross. Embroidery – A design or image made using different colored threads that are sown into a fabric. Etched Glass – Glass that is given a design by etching (removing and making rough) a thin layer of the glass. The part that is etched scatters light and appears cloudy white. Gospel stand - A book stand used to hold the gospel book as it is being read. 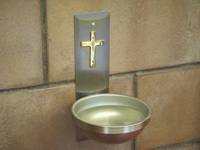 Holy water font- A basin at the entrance of a church or home containing holy water for the faithful to dip their fingers into before making the Sign of the Cross on entering or leaving. Iconostas - A screen or grating that separates the sanctuary from the body (nave) of the church. 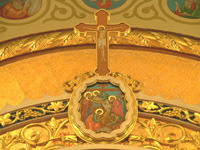 In Greek, iconostas means “icon stand." The iconostas has three doors: the royal doors in the center which are used by the priest during some ceremonies; and two deacon’s doors which are located on either side of the royal doors. 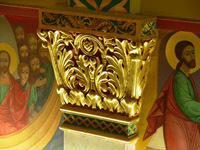 On the iconostas are icons of Jesus Christ, Mary, saints and Biblical Scenes. Incense - A spice or resin that is burned during a liturgical service to give off a sweet, flowery, or spicy fragrance. 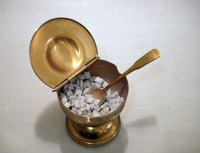 The incense shown is pressed into tiny chips. Kneeler - A low platform, often padded, that is used for kneeling in church. Moleben - A church service composed of special antiphons, tropars and kondaks and invocations. 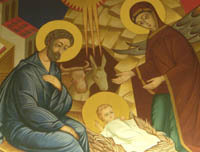 The Moleben to Jesus Christ is typically said in June while the Moleben to the Blessed Mother is typically said in May. Mosaic – A flat design or image made of small colored pieces of stone, glass, or ceramic. Mnohaya Lita - Literally means "Many Years". This is traditionally sung for special occasions to express best wishes. 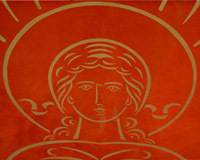 Mural - a painting made on a wall. Some murals can continue around the sides of a building and are useful to tell a story. 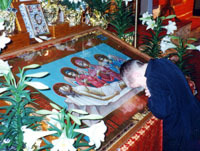 Myrovania – The anointing of the faithful with blessed oil following the Liturgy on a major holy day. 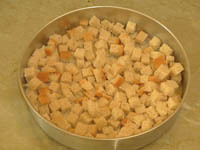 Often, blessed cubes of bread called antidoron are consumed after the anointing. Nave – The main section of a church. Parable – A fictional short story that illustrates a moral. Jesus told over 30 parables to instruct his followers. 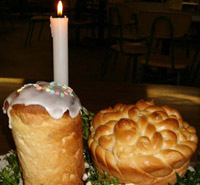 Paska – A rich Easter bread that is usually round with a glossy designed top. 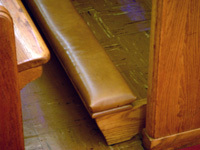 Pew - A long bench with a back used for seating in churches. 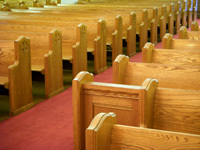 In the past, most churches had no pews and people either stood or knelt during the service. 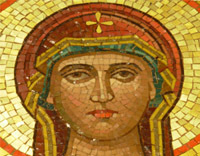 Plaschenycia - A holy shroud having a picture of Christ. This shroud is venerated from Good Friday until Easter matins. Prokimen - A verse from the Old Testament. 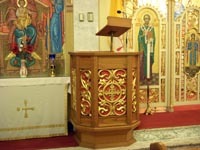 Pulpit - An elevated enclosure used for preaching or announcements during a liturgical service. 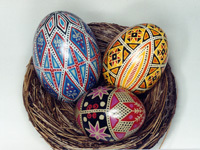 Pysanky - Easter eggs that are intricately hand painted. This symbol dates back to pagan times in Ukraine when the painted egg represented the resurrection of nature to a new life at the beginning of springtime. 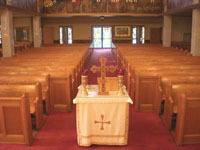 Sanctuary – The part of a church that surrounds the altar. Also called the apse. 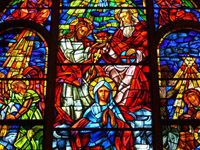 Stained Glass – Glass that has been manufactured to be a translucent (light-passing) color. Sometimes the glass is painted by an artist and sealed into the glass by heating. Stained glass can be made into beautiful designs. 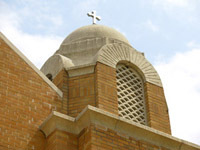 Steeple – A tower on a church which is usually topped by a cross. 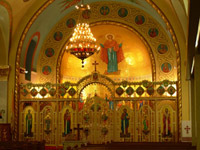 Tabernacle – An ornate large vessel, usually made of wood or polished metal and shaped like a church, that is used to hold consecrated hosts on the altar. Tetrapod – A small table that stands in front of the iconostas. Tetrapod means “four feet” in Greek. 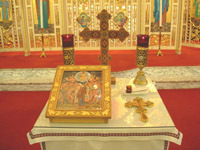 A cross, candles and an icon are typically placed on the tetrapod. 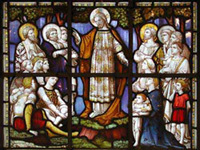 Tropar (Troparion) - A short song describing the deeds and the virtues of Jesus, Mary, or Saints. Vespers - A church service performed in the evening usually of a major holy day. 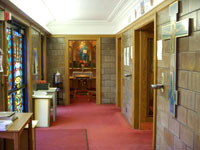 Vestibule – A room or area near the main entrance of a church building. 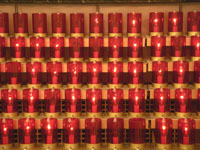 Votive Lights – Lit candles or electric lights that are symbolic of the continuation of a prayer that has been said.